There was a time when a bank branch, or more usually several competing branches, were a seemingly permanent fixture on every Irish main street and in every shopping centre. Not any more. Since the Celtic Tiger died almost a decade ago several banks have disappeared altogether while even the survivors have drastically pruned their branch networks. 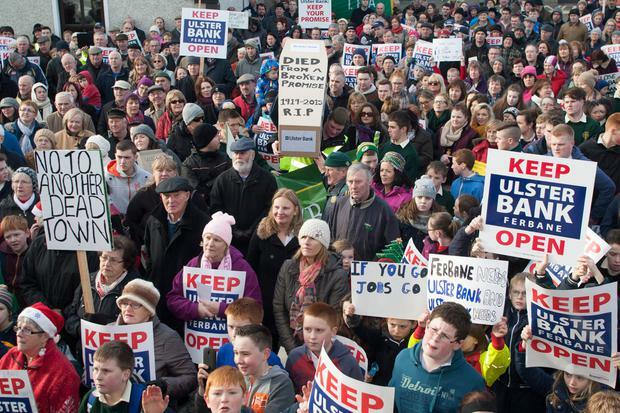 Last week it was reported that Ulster Bank was preparing to announce the closure of up to 30 branches in the Republic. These planned branch closures follow a review of Ulster's operations by management consultants McKinsey. These latest closures will cut the number of Ulster Bank branches in the Republic to just 80 - down from 132 Ulster Bank and another 58 First Active branches in 2007. This will mean that the Ulster Bank branch network will have shrunk by almost 60pc over the past decade. While no official announcement has yet been made by Ulster Bank about the future of its branch network in the Republic, it has already announced the closure of nine branches in Northern Ireland. "Banking has changed radically in recent years. More and more of our customers are using digital technology and fewer are using our branch network," said Ulster Bank in a statement. At least a much shrivelled Ulster Bank branch network has survived. The same cannot be said of some of its former competitors. In 2010, UK bank Lloyds pulled down the shutters on its Irish subsidiary Halifax, which had 44 branches, while in 2013 Danske Bank called time on its Irish retail operation along with its 27 branches. The surviving Irish-owned banks have also taken the shears to their branches. AIB closed 67 branches in 2012 and has reduced the size of its network by 25pc since the crash. An AIB spokesperson pointed out that the bank has closed no branches since 2013 and has opened four new branches over the past four years. AIB now has 205 AIB branches with its EBS mortgage-lending subsidiary having a further 71 branches. However, last week's presentation to potential investors could not have left anyone in doubt as to where AIB sees its future. AIB has cut its branch network by a quarter and reduced branch staffing even further with the number of full-time equivalent staff falling by 28pc. In common with all of the other retail banks, AIB is encouraging its customers to do more of their business with the bank digitally - with 80pc of cash and cheque lodgements now being made this way, up from just 40pc in 2011. Since 2011 the volume of over-the-counter branch transactions has fallen by 36pc while digital cash and cheque lodgements are up by 52pc. Even the surviving branches look and feel very different from the bank branches of yore. AIB now has 20 what it calls "bank lobbies". These are open from 8am to 9pm seven days a week and are populated solely by electronic terminals, through which AIB customers can conduct their business with the bank, rather than by human beings. AIB boasts that 40pc of its personal customers are "digital only" while a further 14pc are "mobile only". Even many of its other personal customers do a proportion of their banking business digitally or by mobile with more than two-thirds of all AIB customers doing at least some of their banking electronically. Ulster Bank is also experiencing a migration of personal customers to digital banking. There was a 22pc increase in active users of its app in 2016, with new features being added - including giving customers the ability to amend standing orders. None of this will come as any surprise to Tom Conlon, associate professor of banking and finance at the UCD business school. "We are seeing the rise of fintech [financial technology] and the ability of fintech to replace branch facilities. I sense that the long-term expectation for branches is minimal," he says. "Bank branches are extremely costly and extremely unprofitable. The banks are going to find it difficult to move to technology because they are based on legacy systems." While the timing was coincidental, news of the Ulster Bank branch closures broke in the same week that Apple Pay, which allows people to pay for goods and services with their Apple devices, went live in Ireland. Apple is the latest non-bank, many of them hi-tech companies, to enter what had traditionally been regarded as the banking space. Other non-bank entrants include PayPal and Irish company Payzone. While most non-bank entrants up to now have been concentrated in the payments space, that's beginning to change. With bank shares in the doghouse, banks are finding it extremely difficult to raise fresh capital. By comparison many of the new entrants are highly-valued technology companies - Apple has a market capitalisation of €728bn - which have access to oodles of cheap capital. "We are witnessing the decomposition of the traditional banking system," says Professor Conlon. Despite the advance of technology and the arrival of new entrants, it was still widely believed that the banks were better able to discriminate between who to lend to and, more importantly, who not to lend to. With the Irish-based banks having written off over €100bn in bad loans over the past decade - something which cost the taxpayer a gross €64bn - that belief has taken a battering. This revelation that the banks were not possessed of some unique skill when making lending decisions coincided with technological advances that allow for better credit scoring and the emergence in the US and UK of new forms of credit such as crowdfunding and peer-to-peer lending. These developments will make it easier for non-banks to enter what had previously been regarded as the "core" banking markets such as lending. As the banks downsize their branch networks An Post, which has 1,100 outlets, has attempted to pick up some of the slack. It has agreements with AIB, Danske and Ulster Bank to allow customers of those banks to conduct routine banking transactions, such as cash lodgements and withdrawals at their local post office. An Post is hoping to launch an own-branded current account in the next few months. Unfortunately the An Post branch network is also subject to the same economic and technological forces that have decimated bank branches. The report on the An Post branch network by a committee chaired by businessman Bobby Kerr is believed to have recommended the closure of up to 80 post offices. This would bring the total down to just over 1,050 as against more than 1,900 in 1992. However, it is understood that An Post will seek more than 200 closures. Bank branch and post office closures tend to hit sparsely populated rural areas disproportionately hard. In practice many smaller towns and villages have lost both their post office and bank branch(es) - a fact which their political representatives are rarely shy about letting us know. . When the latest, but as yet unannounced, Ulster closures are added to the total, over 260 bank branches have disappeared over the past decade. While the end of the banking crisis means that the rate of bank closures will probably ease off, the pressure on branch banking is unlikely to disappear anytime soon. "The banks are stuck in a rut, there is a sense of 'this is what we do'," says Conlon. "Unless they invest in the future they are in trouble."